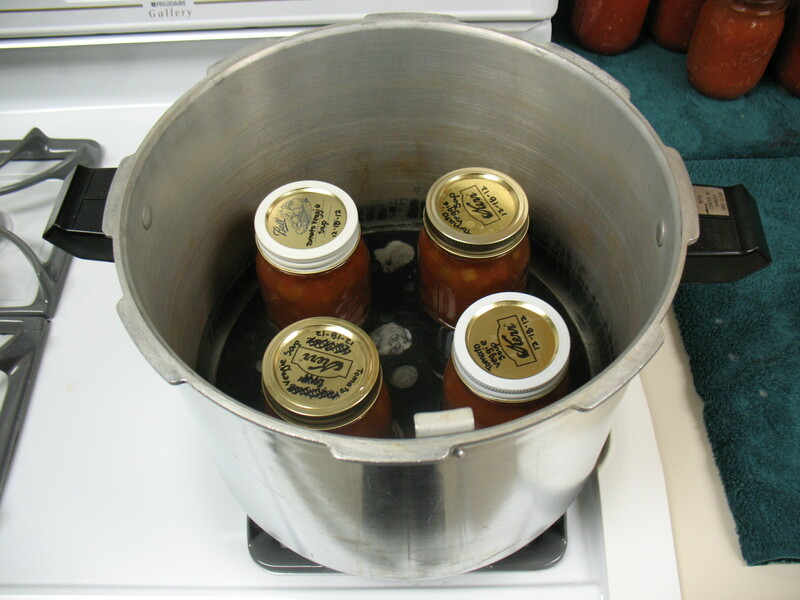 If this is your first time canning or you admit that you could benefit from a refresher of the basics, please first read Using Pressure Canners and Principles of Home Canning. It is important that you DO NOT add noodles or other pasta, rice, flour, cream, milk, or other thickening agents to your home canned soup. These ingredients effect the heat penetration of the jars during processing and USDA does not offer recommendations for their use. Also, if you do choose to use dried beans or peas, you MUST fully rehydrate them first so as not to alter the measurement of water in the final products. The procedure is fairly simple: select, wash, and prepare vegetables, meat, and/or seafood as you would for a hot pack. For more information about preparing for hot packs, refer to So Easy to Preserve or the National Center for Home Food Preservation website. If you are including meat, then cover meat with water and cook until tender. Cool the meat and remove any bones. If you are using dried beans or peas, then add 3 cups water for each 1 cup of beans or peas, boil 2 minutes, and then remove from heat. Soak for 1 hour, then again heat to a boil, and drain. In a large stock pot, combine solid ingredients with enough broth, tomato juice, or water to cover them. Boil 5 minutes. Add salt (or other dried spices) to taste, if you like. Fill jars halfway with solid mixture, and then add the remaining liquid, leaving 1-inch headspace. Adjust lids and process using the tables below. Original sources for this entry come from the National Center for Home Food Preservation website and So Easy to Preserve . Recommended process time for Soups in a dial-gauge pressure canner. This entry was posted in Canning, Food Safety, Recipes, Seasonal Food Tips and tagged bean soups, canning in winter, chicken soups, seafood soups, Soups, tomato soups, vegetable soups on January 23, 2013 by nchfp. Should okra be avoided as a vegetable in soup because it is mucilaginous? Should cubes of eggplant be avoided in soup as a vegetable because it is mucilaginous? If the caution about noodles and pasta is because they are starchy, I’m wondering about non-starch noodle such as tofu shirataki noodle, which comes out of the chiller packages already cooked and gives off 0 starch, as it contains none to give off. But we do not have canning recommendations for eggplant, so we cannot recommend that eggplant be added to canned soup. Likewise, since we do not know the process time or other parameters for canning tofu shirataki noodle or any other noodles, we cannot recommend that tofu or other types of noodles be added as an ingredient to home-canned soup. “Starchy” would not be the only consideration as to whether they can be added without re-doing heat penetration work. Instead, follow the recommendations as written and then add the noodles to the soup AFTER you open the jars and re-heat the soup for serving. Can you just process soup that is already made, providing there are no noodles/rice …? My wife often makes soups over the winter and we always have alot left over. Can she put the leftover soup in jars and process as described above? 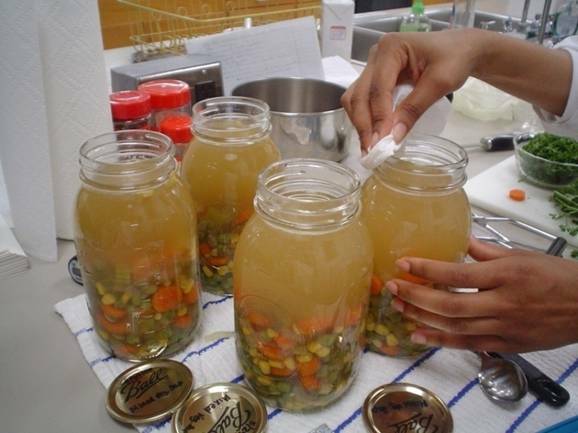 Our recommendations for canning soup are meant to be followed exactly as written, including that it is very important to fill jars only halfway with solids before adding liquid to fill the jar up to the proper headspace, and the soup is prepared for immediate canning. If you want to keep some out for eating immediately, that’s fine. 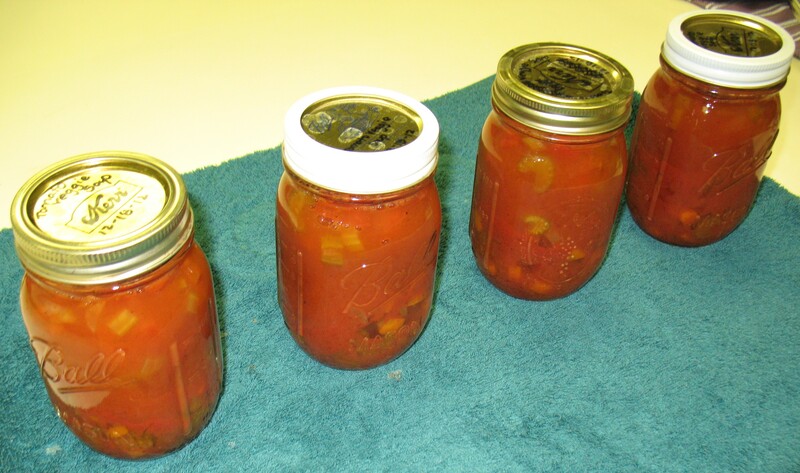 But the soup for canning should be prepared as described in canning instructions and then processed right away. http://nchfp.uga.edu/how/can_04/soups.html , then it may be canned following the process times and steps described there in our canning recommendation.